Today is an important anniversary: 15 years ago on October 25, Senator Russ Feingold was the lone senator to vote against the so-called PATRIOT Act. GetFISARight was not yet a group then; the FISA vote that sparked our formation was far in the future. Now, we are little more than a WordPress site and a Twitter account—and Russ is running to take back his seat. When Sen. Feingold ran for reëlection in 2010 at the height of the Tea Party movement, this group actively supported him; we and many others were disapointed when his principled refusal to take DNC or SuperPAC money resulted in a loss. (Remember, with John McCain in earlier days , he cowrote the McCain-Feingold Act [a.k.a. the Bipartisan Campaign Reform Act]; holding true to his principles was certainly a factor in, if not solely responsible for, costing him his reëlection). Now, Sen. Feingold is looking to return to Washington, and despite what we have learned about the abuse and misuse of a bill rushed through just weeks after the shock of “9/11”, as that horrible series of events has come to be called, he is still being criticized for refusing his vote on that day. Despite improvements in the originally-proposed text, he stood by his defense of the need for proper process even, maybe especially, in dangerous times. So, here we are approaching Election Day 2016; standing by our previous endorsement (without consultation with my colleagues on this page, as we are rarely in touch, but with trust that they agree), I encourage all to celebrate this anniversary by doing something to support Russ Feingold’s campaign—send an e-mail, make a call, post a Tweet, send a dollar to Russ’s campaign, make a profile picture honoring his integrity—your choice! On this day 1‌5 yea‌rs ago, I was the sole member of the United States Senate to vote against the Patriot Act. And, 1‌5 years later, I am still being attacked for my vote. When I cast that vote, only si‌x we‌eks had passed since the horrendous attacks on 9‌/‌11. Initially, I wanted to vote for an early version of the bill, which I believed protected individuals civil liberties while also updating our laws to account for new technologies. But then, the Bush administration held secret meetings, took shortcuts, and introduced a new version of the Patriot Act that couldn’t be changed. This isn’t how our democracy should operate: Behind closed doors and without transparency. It was outrageous. The final version of the Patriot Act gave the federal government far too much power to spy on the American people. Congress held its breath and crossed its fingers that this power wouldn’t get abused, and the bill was passed. When I voted no, I voted my conscience, and I voted to do right by the people of Wisconsin and the people of America. I voted no because national security and civil liberties should not be mutually exclusive — and should be beyond partisan politics. Now, 1‌5 ye‌ars later, Senator Ron Johnson and his allies are still attacking my vote against the Patriot Act. If Senator Johnson and his super PACs were listening to the people of Wisconsin, they would know one thing: their attacks won’t work. There are just over tw‌o wee‌ks left in this campaign. It’s going to take the full force of this grassroots team to combat all these outrageous right-wing attacks and win this race. I am also very troubled by the broad expansion of government power under the Foreign Intelligence Surveillance Act, known as FISA. When Congress passed FISA in 1978 it granted to the executive branch the power to conduct surveillance in foreign intelligence investigations without meeting the rigorous probable cause standard under the Fourth Amendment that is required for criminal investigations. There is a lower threshold for obtaining a wiretap order from the FISA court because the FBI is not investigating a crime, it is investigating foreign intelligence activities. But the law currently requires that intelligence gathering be the primary purpose of the investigation in order for this lower standard to apply. This bill changes that requirement. The government now will only have to show that intelligence is a “significant purpose” of the investigation. So even if the primary purpose is a criminal investigation, the heightened protections of the Fourth Amendment won’t apply. It seems obvious that with this lower standard, the FBI will try to use FISA as much as it can. And of course, with terrorism investigations that won’t be difficult, because the terrorists are apparently sponsored or at least supported by foreign governments. 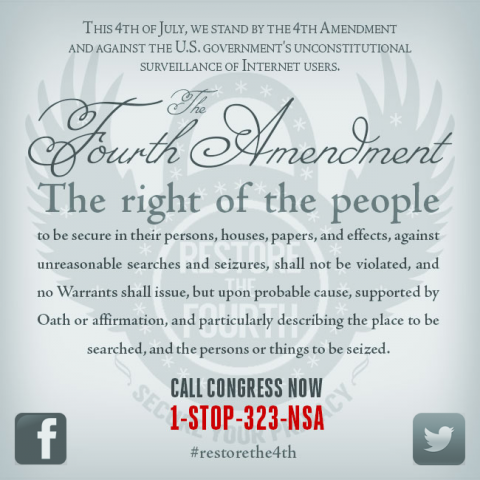 This means that the fourth amendment rights will be significantly curtailed in many investigations of terrorist acts. The significance of the breakdown of the distinction between intelligence and criminal investigations becomes apparent when you see the other expansions of government power under FISA in this bill. One provision that troubles me a great deal is a provision that permits the government under FISA to compel the production of records from any business regarding any person, if that information is sought in connection with an investigation of terrorism or espionage. Now we’re not talking here about travel records pertaining to a terrorist suspect, which we all can see can be highly relevant to an investigation of a terrorist plot. FISA already gives the FBI the power to get airline, train, hotel, car rental and other records of a suspect. But under this bill, the government can compel the disclosure of the personal records of anyone – perhaps someone who worked with, or lived next door to, or went to school with, or sat on an airplane with, or has been seen in the company of, or whose phone number was called by — the target of the investigation. And under this new provisions all business records can be compelled, including those containing sensitive personal information like medical records from hospitals or doctors, or educational records, or records of what books someone has taken out of the library. This is an enormous expansion of authority, under a law that provides only minimal judicial supervision. Under this provision, the government can apparently go on a fishing expedition and collect information on virtually anyone. All it has to allege in order to get an order for these records from the court is that the information is sought for an investigation of international terrorism or clandestine intelligence gathering. That’s it. On that minimal showing in an ex parte application to a secret court, with no showing even that the information is relevant to the investigation, the government can lawfully compel a doctor or hospital to release medical records, or a library to release circulation records. This is a truly breathtaking expansion of police power. An obscure committee in the federal bureaucracy recently voted to allow the FBI to hack into your personal devices and access your personal data without obtaining an individual warrant to do so. The changes approved by the Judicial Conference Advisory Committee on Criminal Rules to what is known as “Rule 41” would allow the government to get a single warrant to hack into an unlimited number of computers and digital devices owned by law-abiding Americans if their device was merely affected by criminal activity. This dramatic and constitutionally questionable expansion of the government’s hacking and surveillance authority is poised to go into effect on December 1 – unless Congress acts. Such a change should be debated by Congress in the light of day – not handed down by unelected bureaucrats. You are currently browsing the Get FISA Right blog archives for October, 2016.